The TVU Era TE700 can deliver the same high quality, low latency and resilient live video transmission found in more expensive professional encoders. Designed for use with a single IP Ethernet connection, TVU Era makes live video streaming for social media platforms, news pool feeds, web streaming and more from anywhere easily. Also, TVU Era seamlessly integrates with TVU’s ecosystem for a comprehensive video workflow solution. Compact and Feature Rich – TVU Era is the small transmitter that can! 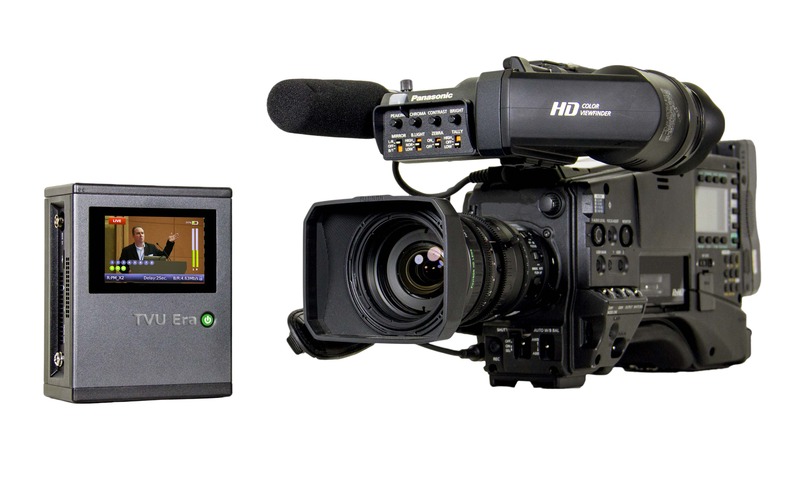 Featuring variable bitrate or constant bitrate encoding over public Internet, TVU Era features TVU’s traditional one-button operation for live streaming and on-board Lithium battery for extended live recording in the field. Just plug in a camera and an Ethernet connection and you’re ready to transmit live. Touch Screen Controls – TVU Era features simple, easy-to-use LCD touchscreen controls that provide video preview, system status and control over each transmission. You can also control TVU Era from a studio location with a TVU Receiver or Transceiver video decoder. Learn more about our TVU Receiver or Transceiver here. Fully Compatible with TVU Grid – TVU’s IP based video switching, routing and distribution solution allows a broadcaster to share a TVU Era live video transmission with any other TVU Grid enabled station, operations center or physical location. TVU Grid features very low latency when switching, routing or distributing live video. You can use TVU Era to live stream on social media. TVU Era supports Facebook Live allowing you to transmit live video directly using the Facebook platform. Learn more about using TVU for Facebook Live here.